Y ou're on vacation and you want to be comfortable. But you don't want to blow your whole vacation budget on a hotel. Well, relax. In any of the many First Class hotels in San Miguel de Allende, you can stay in complete comfort and style without breaking the bank. Most of these lovely hotels have been part of the San Miguel scene for years—since well before most of the newer, super-luxury properties were even a gleam in a hotelier's eye. They have the experience to do it right. And the newer luxury hotels have learned very well, thank you, how to pamper their guests. 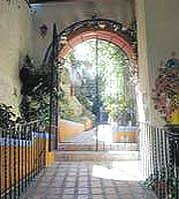 Here's a list to help you choose a really comfy temporary home in San Miguel. Notes: This spa-type property is just off the road to Dolores Hidalgo and only one mile from the Santuario de Atotonilco, the "Sistine Chapel of the Americas." The resort's amenities include both covered and open natural hot springs pools, an open jacuzzi, steam room, and tennis courts. Notes: Located in a 300+-year-old-building with views of the Jardín. Suites have full kitchens. Other rooms have coffeemaker, small fridge, microwave. Free wireless internet. Cable TV. Notes: A gorgeous newer property on the hill high above town with fabulous views. Gardens and terraces on many levels with ponds and fountains. This is an especially nice property for a wedding in San Miguel de Allende. Wireless connection in some rooms. Guest computer available. Notes: Built in a 440-year-old remodeled orphanage, this is a famous older San Miguel hotel. There's a small pool (fee charged for use), gardens, and a restaurant. Many rooms have kitchenettes for longer stays. 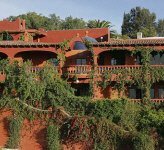 Notes: A simply gorgeous property with a superb location just off the Jardín. The decor features lots of wood, boveda ceilings, hand-made ironwood furniture, talavera tiled baths, interior patios. Valet parking available. Notes: A large, full-service hotel that calls itself the "House of 300 Bovedas" for the domed ceilings in each room. Most rooms have kitchenettes. Large heated pool with patio bar, large gardens, kids' play area, full restaurant, heated pool, gym. A good bet for golfers, since it's right next to the Malanquin Golf Club. Special greens fees for guests. Notes: If you like to be in the middle of things, this has the best location of any hotel in San Miguel de Allende. It faces right onto the Jardín. It holds a special place in my heart since it was the very first hotel I ever stayed in San Miguel. On-site restaurant with a view onto the square. Wireless internet. Parking available. Notes: Another very large, full-service hotel with extensive grounds. Restaurant, lobby bar, shops, pool, tennis courts. It even has its own bullring. Good for meetings or large weddings. Notes: Colonial-style hotel with lots of wrought iron, carved wood, beamed ceilings. There's an on-site restaurant with room service, bar, wireless internet, gym. Suitable for a San Miguel wedding. Valet and shuttle service to downtown are available.